With our user base of 50 million Wazers around the world, we can analyze user behaviors against the backdrop of important events, uncovering interesting cultural trends. 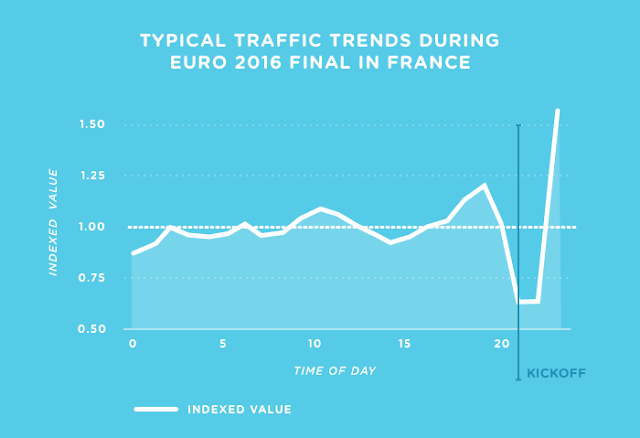 Recently, France, one of the largest Waze communities, hosted the Euro 2016. Twenty-four teams competed in the popular soccer tournament, vying to win the cup for their nation. Ten percent of all match attendees were Wazers, and here's what we learned based on their driving behaviors on Waze. Over 240,000 Wazers went to UEFA 2016. 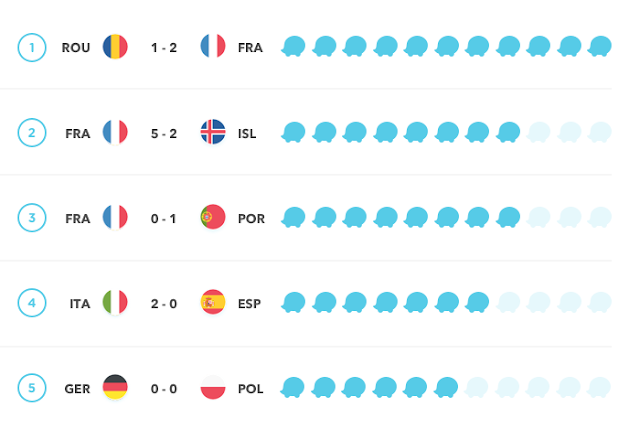 "Waze drives to stadiums" can be used to assess games' traction or popularity, and it's with no surprise that we discovered the top three matches were French games. What is a surprise is that the final match, France vs. Portugal, only ranks third, suggesting that the excitement around the France vs. Romania opening games yielded a larger draw than the classic rivalry with Portugal. Completing the top five, Italy vs. Spain ranks fourth as one of the decisive games of the competition, followed by a classic neighboring country clash, Germany vs. Poland. An index of drives to the top 5 matches. French fans may have had the highest attendance rates, but let's also look at fan loyalty. How far are fans willing to go to support their teams? Compared to the average 31 km traveled by a Wazer per session to all games, the Poland vs. Portugal derby of the qualifying stage saw an impressive 130 km average, showing that their fans were willing to go the extra distance and travel to the Vélodrome in Marseille. The soccer culture revolves around hospitality, celebration, and social gatherings, so it was interesting to look at how driving behavior changed throughout the tournament. On the day of the final, we observed a unique phenomenon. Compared to a typical Sunday, Wazer traffic exceeded its normal volume by 21 percent before match time, right before dropping almost 50 percent after the kick-off. Game day saw huge spikes in traffic before and after the game. After the match, drives resumed high levels, as some Wazers celebrated a victory, while others sulked home in defeat. Waze certainly has a lot to gain from the interesting patterns we captured, but any marketer could use these unique insights to feed strategies during large sports events. On the one hand, the combination of these types of events and Waze's key role in guiding drivers to their destination offers brands a unique opportunity to engage with their users. 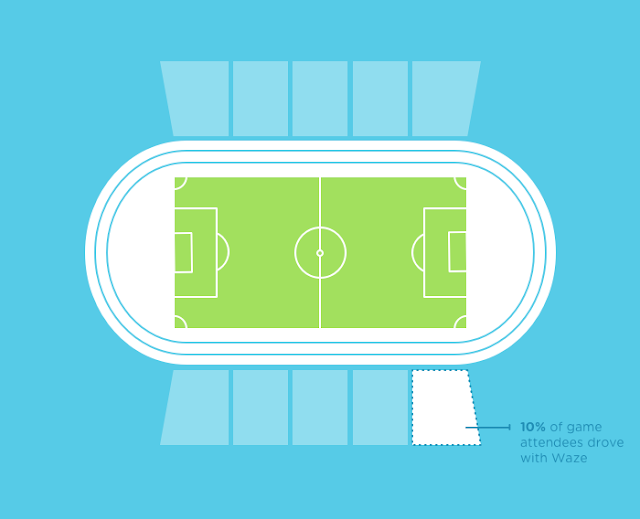 An effective campaign can suggest a venue for a post-game celebration, or raise awareness of a special offer valid during the game—all trackable and saveable through Waze's ads platform. Waze. Longer drives, concentration of drives before games, time of day, and destination types combined in a clear, customized message can optimize a brand's engagement across that period. For example, we saw that Wazer navigations to hotels spiked at levels 86 percent higher for the grand finale of the Euro compared to other weekends. 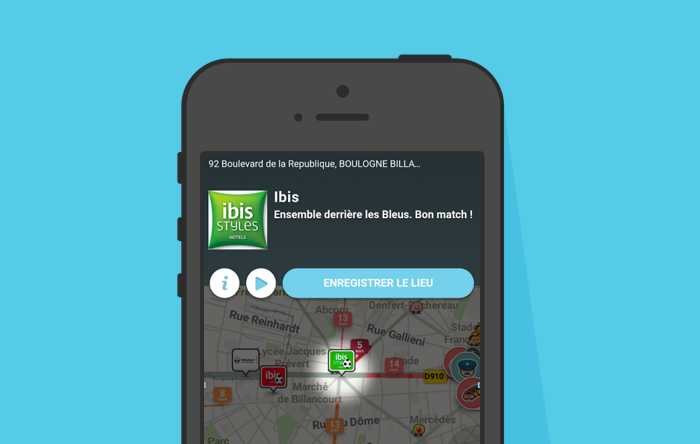 Ibis, a leading hotel chain in France, stayed ahead of the game and sent team France support messages before the final match. Their campaign was clever, timely, and associated their brand with a memorable moment for Team France supporters. Ibis Hotels campaign message: Backing the Blues together. Enjoy the game! In the wider context of brand advertising, one typically associates these events with TV, and marketers outbidding each other for on-air time. Waze frees up further engagement minutes, moments, and opportunities for brands to reach their consumer in a measurable, efficient way.